WeChat public accounts, China’s most influential social media channel for enterprises, are overwhelmingly dominated by tech, a study by social marketing startup Robin8 has found. Robin 8 released the results of the study at CES on Thursday, which crawled through over half a million WeChat public accounts across one month. Each account was scored according to a number of factors including their average page views per post, their total number of post page views, and their total number of ‘likes’ on posts. All five had more than half a million page views in April, with Xiaomi’s public account gaining 228,601 page views for a single post. Not all of the public accounts on Robin8’s top 100 list were companies – quite a few are operated by individuals, such as Yinghuan Li, a chief correspondent and tech journalist for The Time Weekly (时代周报) who is considered a wang hong or internet celebrity. Some accounts were incredibly prolific in April, such as 电脑报 (Computer Report, our translation), which published 163 posts. Others, such as Xiaomi’s public account, had less than ten. In addition to the top 100 list, Robin8 also shared other insights from its one-month study, such as popular keywords and brands. Again, technology had a strong presence as “mobile phones,” “design,” “products”, and “technology” were identified as popular keywords, and tech brands such as Apple, Huawei, Tencent, and Alibaba were especially of interest to large numbers of WeChat users. According to Robin8’s CEO, Miranda Tan, the company’s “wang hong search engine” will launch next Friday. The search engine will leverage the company’s natural language processing (NLP) algorithms and big data analytics to pull and analyze data from social platforms, such as Weibo and WeChat public accounts. Duan Yong, CTO of Robin8, explains the analytics behind the company’s WeChat study. Robin8’s results were part of a larger discussion on KOLs (Key Opinion Leaders) and wang hong in China. Though Robin8’s study revealed the popularity of technology-related public accounts, Mr. Yong said that public accounts on any topic have the potential to be influential. “In every vertical, you can find a wang hong. In their small circle, they have influence. 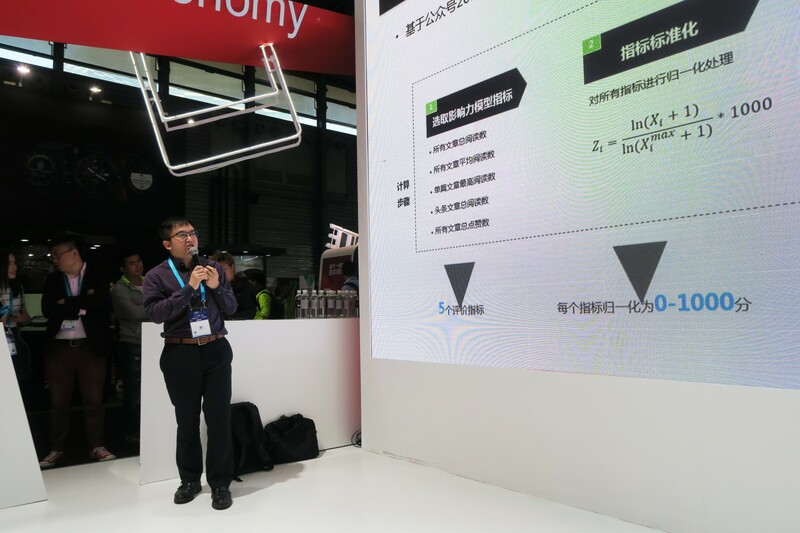 You can find wang hong in VR, robotics, electric cars – anything,” said Mr. Yong during a panel discussion following his presentation. Robin8’s product helps companies find wang hong, using content from social platforms like WeChat, Weibo, and Douban. An increasing number of brands are seeing wang hong, from WeChat public accounts to live-streaming hosts, as a way to market their products, increase brand awareness, and produce interesting content with high conversion rates. Last month, one of China’s most well-known internet celebrities, online video comedian Papi Jiang, raised 22 million RMB (about $3.4 USD) in a bid from cosmetics startup Lily & Beauty during an ad auction. Though Papi Jiang is exceptional, the diehard nature of wang hong fans is a unique characteristic of China’s internet celebrities. It’s that obsessive fandom that makes wang hong, even those with smaller or more niche fan bases, so valuable to brands. In addition, unlike companies, wang hong can come across as more genuine and sincere. However, as one of the panelists noted, companies will need to be careful when dealing with wang hong. Unlike more traditional KOLs, such as actors and sports stars, wang hong are more independent and, in some ways, unpredictable. Correction (5/13/2016 17:19): This post was updated to correct the spelling of Robin8’s CTO’s name.